On Midsummer’s Day 1755 Thomas Whitty commenced weaving on the first carpet to be made in Axminster, Devon. Subsequently, when a new carpet was finished, it was often carried through the streets of the town to the sound of the bells from The Minster Church of St. Mary. The carpet would then be laid out across the pews of the former Independent Church, now the United Reformed Church in Chard Street for all the townsfolk to see. Over the next few years the fame of Thomas Whitty and his Axminster carpets spread far and wide. They became a byword for excellence that is still true today. Carpets from this era continue to grace the floors of many royal palaces and country houses not only in the UK but in many other countries of the world. Their presence acting as a lasting memorial to English craftsmanship and enterprise. Although production ceased in 1835 with the bankruptcy of the original company, the late Harry Dutfield reintroduced carpet manufacture back into the town a century later in 1937. Bringing with him from Kidderminster a number of skilled workers, Harry Dutfield sowed the seeds for the renaissance of the carpet industry in Axminster just before the outbreak of the Second World War. Carpet manufacture was suspended between 1939 – 1945 whilst essential items including stirrup pumps, aircraft parts and camouflage netting were made for the war effort. 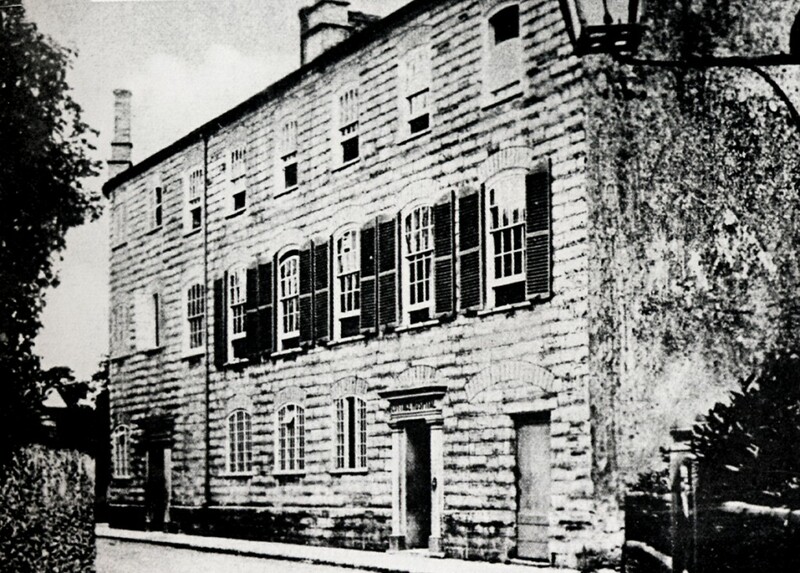 However, it was back to the looms with the cessation of the war and Harry Dutfield quickly re-established the name of ‘Axminster’ as a quality product and once again Axminster carpets began to cover the floors of the homes of royalty and nobility throughout the world much as they had over one hundred years earlier. The work of both Whitty and Dutfield is a lasting memorial to English craftsmanship and enterprise and it would be appropriate that a permanent memorial to their achievements and contribution to our heritage be established in the town they made famous. The opportunity has now arisen whereby the old Whitty carpet factory located in the centre of Axminster could be purchased to house a museum to commemorate, not only the achievements of Whitty and Dutfield, but to recognise the part the town has played in the total history of the UK. Historically, there was a Roman garrison stationed in the immediate area and the Fosse Way crossed the Dorchester to Exeter road close to the town. The centre of the old market town is dominated by the Minster Church of St Mary the Virgin, parts of which date back to Saxon times and more latterly in the 17th century the town gave shelter to the Royalists during the English Civil War. 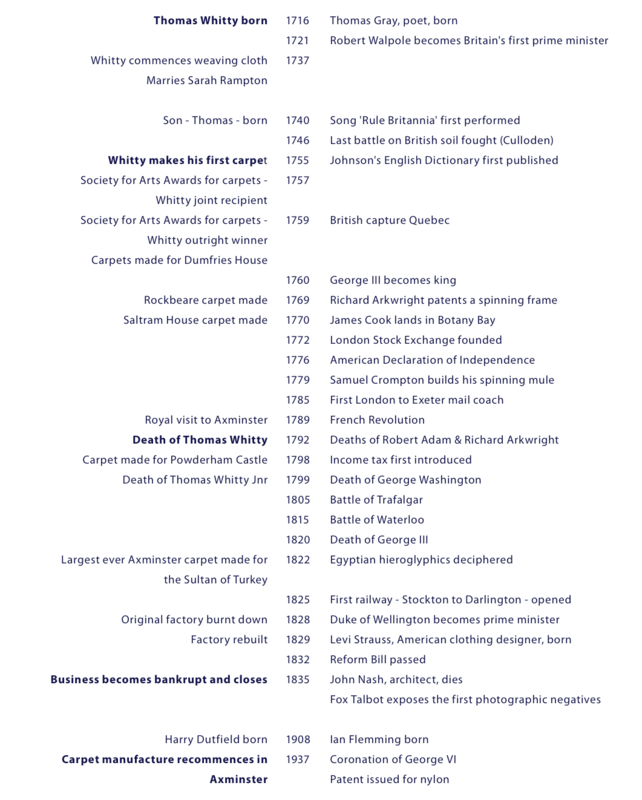 In June 2005 a series of events were held to mark the 250th anniversary of the manufacture of the first Axminster carpet. These included a specially commissioned musical play highlighting the life and times of Thomas Whitty; the casting of two new bells for the Minster church which were specially commissioned for the occasion and named after the two great weavers, the ‘Whitty’ and the ‘Dutfield’ bells; a Summer Ball and a Concert, culminating in a parade through the streets of the town of a specially woven Whitty replica carpet which was presented to the nation. It was felt that these events provided a very appropriate starting point for this project.